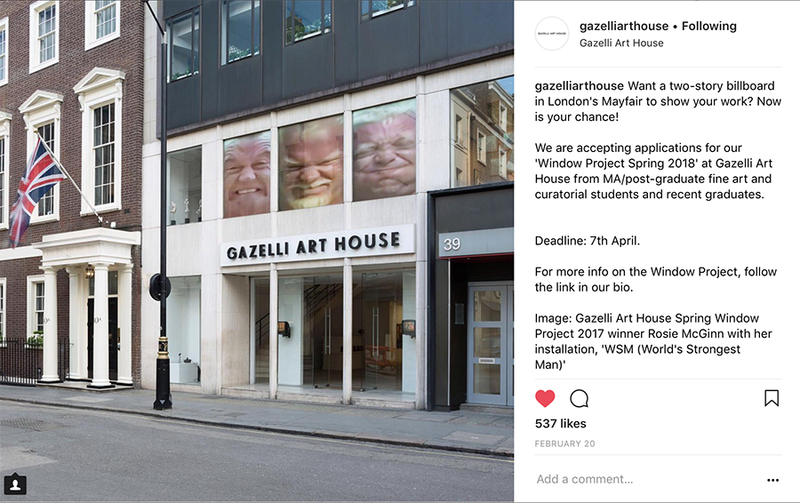 Rosie has just graduated from MFA Fine Art At Wimbledon, her final work provoked a lot of attention with visitors curious to see what will happen and also mentions on social media. Rosie also received the Mercer’s Award this year, below she tells us about that, her work and Wimbledon experience. “I was so amazed and grateful to have been awarded the Mercer’s Award! The money towards studio space and materials means that I am now able to afford to sustain a studio in London for a few years and continue to make work and pursue my career as an Artist. I have always worked hard throughout my studies to support myself financially so this award is truly overwhelming and will be treasured. I think what they are doing at the Mercers’ Company is incredible and to give this opportunity to someone in the creative sector is hugely admirable. Their generous contribution now gives me the belief and means to pursue a path and take advantage of the momentum following the show. I studied my Foundation at University for the Creative Arts in my hometown, Maidstone, before it got shut down (pretty gutted about this as there’s no longer a creative hub there). I then studied my undergraduate degree in Falmouth, which was beautiful and so laid back it was almost horizontal! So for my Masters I knew I was ready for the chaos of London but I really liked the less frantic atmosphere at Wimbledon. The course was also pretty ideal in that it wasn’t forcing me to channel my practice into a specific medium, I could remain free and flit between video, sculpture and installation, and I knew I needed a two year course to give my practice time to grow and change. At Wimbledon a load of tutors and technicians were a huge help over the entire course. All of my tutors allowed me the freedom to scale up, be ambitious and trust my instincts. The woodwork and metal team were wicked and always interested in the work! Specifically for one of my final pieces, ‘HOWSE’. Grzesiek in the DMC suite introduced me to the world of Arduino, which I was previously intimidated by. Although I love the unpredictable and unreliable world of analogue motors, the Arduino micro-controller board took the work into a higher level of precision. In my current practice I am currently exploring and unpicking life’s fleeting moments of euphoria and despair. Whilst my work often looks at simple concepts, the mechanisms used are as complex as the feelings they are trying to portray. So whether it’s a cluster of bobbing marathon heads, or a weightlifter stuck lifting the same weight, or a football crowd endlessly celebrating a winning goal, I am using sculpture, video and kinetic installations to explore and dismantle these heightened moments. The work has more recently floated between (British) sport and leisure whilst observing the provincial areas and communities where rituals such as Bingo and football provide a sense of faith, community and escapism. For my summer show in June I exhibited two pieces. 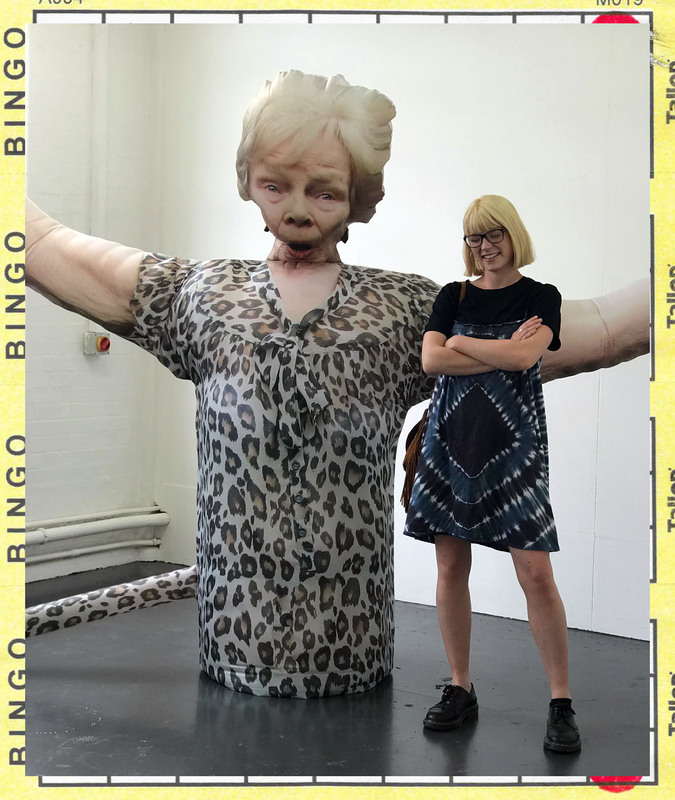 ‘HOWSE’ (2018) is a giant hand-made inflatable bingo woman (on a looped timer) reliving the frenzied rise and fall of a ‘full house.’ The inflatable (2.5 metres high and spanning 3.5 metres across) is connected to a bouncy castle air blower which turns on for 10 seconds and off for 130 seconds. 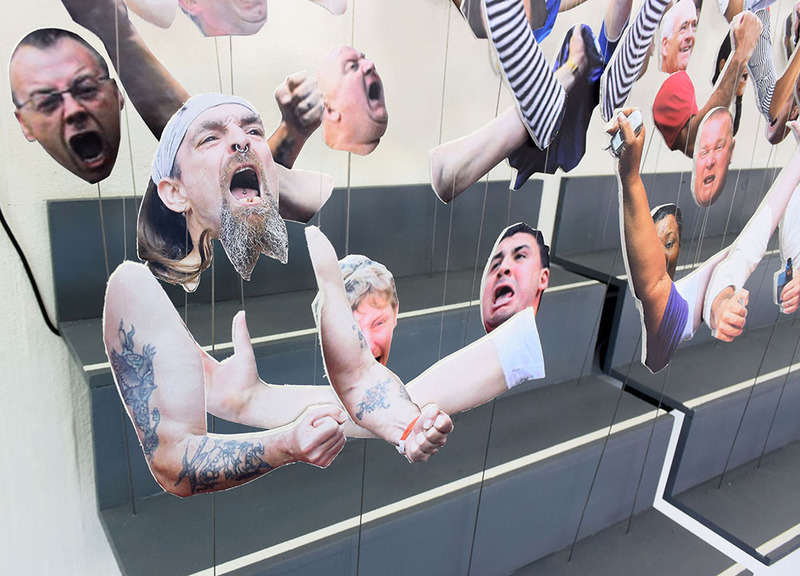 Joyful, terrifying and full of dark (Monty Python-esque) humour, the installation’s light-hearted framework is undercut by currents of raw emotion. As the Bingo woman’s cigarette drops to the floor her whole body sinks downwards, her head bows, her arms stretch and she lies crumpled and punctured on the ground. Then as the blower is revived by the timer, the air rushes back through her, she bursts into consciousness, stretches at the seams and roars like Godzilla. By locking viewers into a never-ending cycle (of inflation and deflation), the work attempts to amplify and question our current cultural restlessness. ‘HOWSE’ is definitely one of the most (unintentionally) attention-seeking artworks I have ever made! It made ‘GET IN’ seem quite contemplative and subtle, which I liked. On our Private View night seeing a big crowd of people surrounding her, waiting with their phones was quite a funny scene. Due to the timings (2 minutes off, 10 seconds on) it meant that the viewer could catch her at any point in her unrelenting journey through the highs and lows of bingo (life). Maybe they would completely miss her inflating if they rushed around the room but they would still catch her deflating and sinking as the air escaped from the top of her head. I was really happy to see kids interacting with both pieces, although some were terrified by ‘HOWSE’! It did surprise me in its ability to build a sense of tension, hold viewers in a position of contemplation and provoke an involuntary laugh/smile/sense of terror…. ‘GET IN’ (2018) (exhibited on the opposite end of the room) is a kinetic installation that replicates the monumental moment when a football team scores and the crowd celebrates (very conveniently timed alongside the World Cup). It features two football stands from which football fan heads on wires stand upright. Above are two hanging structures holding the football fan’s arms, which lift up and down via windscreen wiper motors. When the arms are pulled to their highest point they align with the heads in a brief moment of celebration until they drop again and repeat the cycle. As an Artist who explores what it is that makes us human, a football crowd can bounce from one end of the euphoric scale to the other. Football isn’t necessarily represented or questioned very much within the art world but why not? I am an Artist who goes to galleries but I am also a football fan who goes to matches. If sport is engaging with such a wide spread of society maybe the art world could tap into this appeal. You can follow Rosie and her work on her website and her Instagram.